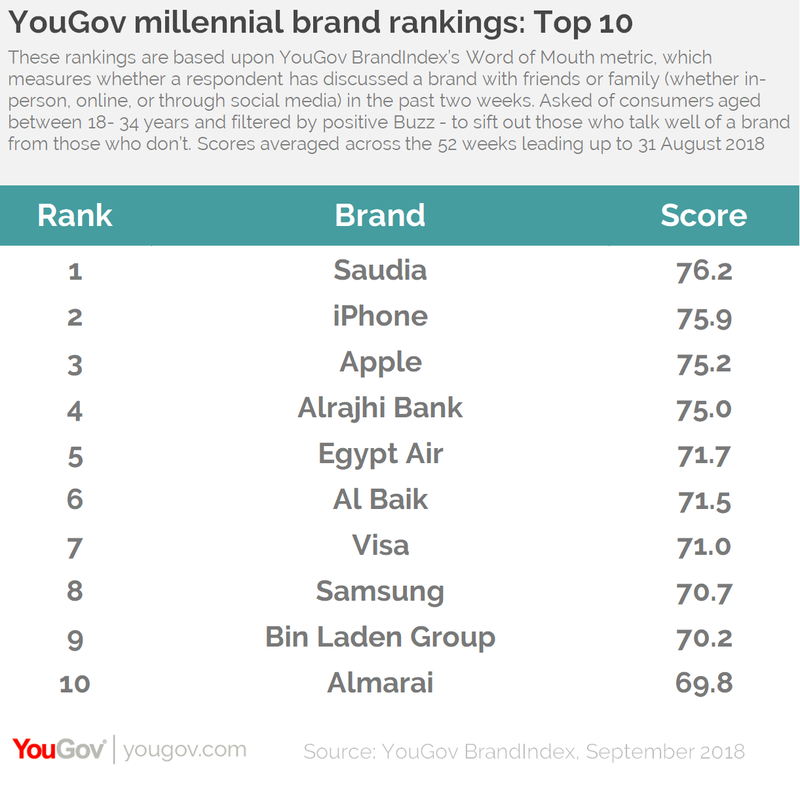 on September 24, 2018, 10:47 a.m.
Saudi Arabia’s airline brand, Saudia, is the most positively talked about brand amongst youngsters in the country. Saudia has replaced Apple, which was on the top of the list the previous year but has slipped down to number three this year. However, smartphone giant iPhone has climbed up to the second position from number four last year. Al Baik has seen an improvement in its brand image and moved to the sixth position from ninth last year. Consumer electronics giant Samsung on the other hand has seen a decline in its image and has moved down to eighth spot this year. While Facebook lost its spot in the list, real estate group, Bin Laden and beverages brand Almarai have made an impressive entry into the list at spot nine and ten, respectively. YouGov also looked at brands that have experienced the biggest uplift in positive word of mouth over the last year. Beverages seem to be particularly resonating with the Saudi youngsters. 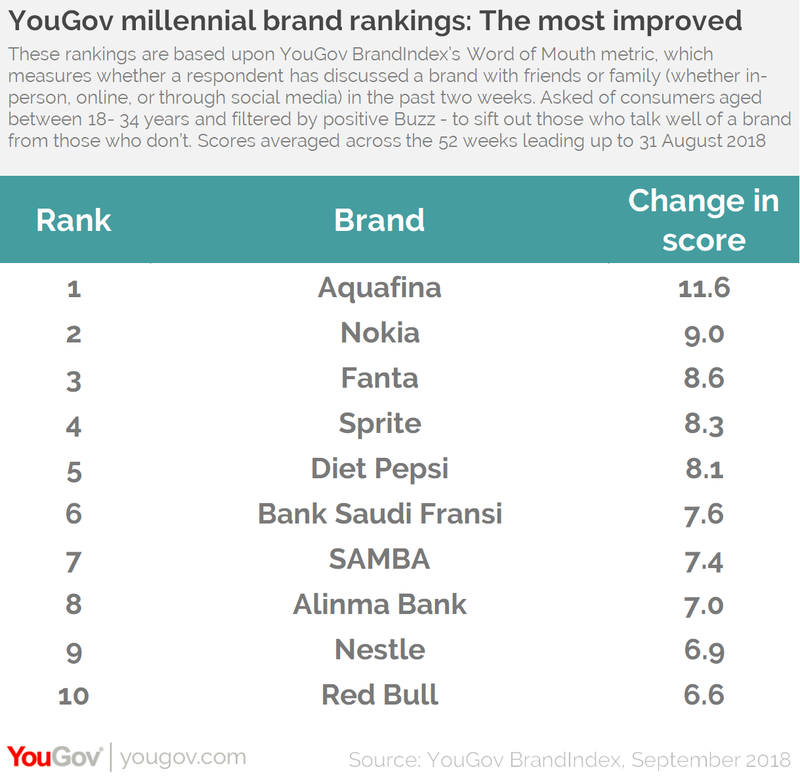 Aquafina has seen the greatest improvement in its brand image among millennials this year, with a change in score of +11.6. Brands like Fanta, Sprite and Diet Pepsi have also seen significant improvement in their brand perception this year.